Lots to Love Babies with varying facial expressions and ethnic diversities. Each lovable chubby doll is dressed in a washable and reusable diaper featuring Velcro tabs. 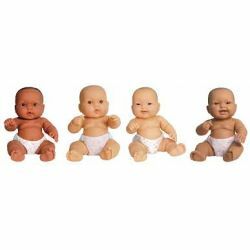 The 4 gender-neutral dolls may vary in clothing style and colors. Measures 10 inches each.